At Janicki Industries, community involvement is linked to the Janicki family’s long history in Skagit County. The Janicki family manages multiple businesses in the Skagit Valley including Janicki Industries, Janicki Logging and Construction, and Janicki Energy. The family and its businesses are active volunteers and supporters of local programs such as Habitat for Humanity, United Way, Boy Scouts of America, area schools, Soroptimist International and Rotary. Locating their newest facility in the eastern part of the county was a conscious decision to create jobs and economic opportunities for the people living in that area. Janicki Industries employees celebrated Halloween today. The winner was our feathered friend the Peacock, Valerie. We were also visited by four T-Rex, a Ghost Buster, Cowboys, Wednesday from Adams Family, Mickey, Cat-n-the-Hat, witches, pirates and more. Janicki Industries employees celebrated Christmas with an ugly Christmas sweater contest. And the winner is Tandra! Janicki Industries sent several teams to the Ski-2-Sea competition this year. Thank you to the many employees who competed in skiing, running, bicycling, paddling, and swimming. Thanks for your great team work and die-hard competitive spirits. The “Queen of the Skagit” was a stunning spectacle in Sedro-Woolley’s 4th of July, Loggerodeo Grand Parade. This Janicki Industries-designed float, duplicating a steam-powered riverboat included passengers dressed in period costumes, a moving paddle wheel, and a live band. It was pulled by four 2,000 pound Belgian draft horses. We all hope everyone had a fun and safe 4th of July this year! Janicki Industries built an Old Town Sedro-Woolley float for the 4th of July parade. There was a bank robbery, lots of shooting and even a poker game in the saloon. The piano player kept playing thru the action and the upstairs hotel included three Saloon Girls. The 4-H Sea-Tech Club members underwater vehicle faced a real-world challenge. The mission set by MATE ( Marine Advanced Technology Education) for the competition simulated capping an exploded oil well, based on the Louisiana-coast disaster of 2010. Clubs in the program develop remotely operated underwater vehicles (ROV’s) and compete in regional, national and international competitions. This year Skagit County’s Sea-Tech 4-H Club Team Omega qualified to compete in the international competition in Texas. The event is a culmination of months of work designing, fabricating, programming and testing club ROV’s to execute a variety of mission tasks. Sponsored by (MATE), the event encourages students to study science, engineering and technology. The competition uses realistic under water challenges that expose students to many different aspects of marine-related technical skills and occupations. Team Omega fabricated their ROV at Janicki Industries’ composite fabrication facilities in Sedro-Woolley and Hamilton, WA. The historic Ski to Sea Race is a 100 mile relay race of seven different sports: Cross-country skiing, downhill ski or board, running, road cycling, mountain biking, canoeing and kayaking. The race starts on Mount Baker and ends in Bellingham Bay. The Ski to Sea race was Team Janicki’s most challenging to date. Will Whiton kicked off the effort, surviving the cross country ski leg, Jimmy Wood turned in a blistering fast time on the snowboard leg, and Mike Wright flew over the 8-mile running leg. Jimi Diedesch started strong in the road bike segment and was holding Team Janicki’s place in the top 100 overall race teams. Then tragedy struck the first time: a six-inch blow-out in his rear tube put him on the sidelines “a long ways from nowhere” awaiting pick up and transport to hand the baton to paddlers Austin Williamson and Mike Conboy. Once on their way, the canoe team was strong, and John Garland hammered out the 21 mile mountain bike course. 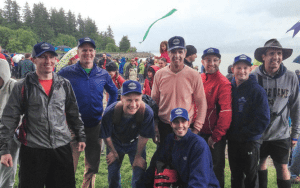 And then Lady Luck tossed a second bad roll of the dice to Team Janicki: late day chop had made Bellingham Bay so dangerous that the Coast Guard shut down kayaking for any who had not launched that final leg in the race. Jon Curtis and Sean Madden were dry-docked. Team Janicki finished 387th, out of 500 registered teams. Concrete High School’s FIRST Tech Challenge Robotics Team received support from Janicki Industries this year. FIRST – For Inspiration and Recognition of Science and Technology – is a nonprofit organization with a goal of encouraging student interest in science, technology, engineering and math. In the Tech Challenge, teams use a modular robotics platform to conceive, build and compete in a FIRST-designed game. 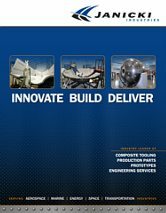 Janicki Industries’ engineer James Diedesch served as a mentor for the Concrete team.